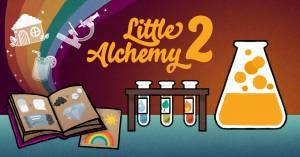 Little Alchemy 2 is a new puzzle game of science and wonder where just like the original game you are presented with several initial elements (air, fire, earth, and water) and you must combine them together to create new materials and natural substances. There are over 600 possibilities you need to discover to complete your library at 100%. Each combination only needs two objects and they can be the same or different objects. What is the Encyclopedia for? What are the Element Combinations? How do you Make a Human? How do you Make an Animal? How do you Make a Plant? What are the Weather, Geology and Mineral Combinations? How do you Make the Legend Items?